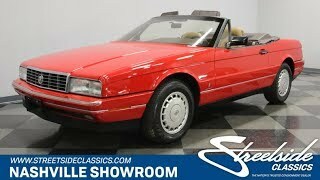 Hi, I am interested in your 1988 Cadillac Allante (stock #0995-NSH) listed on Autotrader for $13,995. I'd like to get more information about this vehicle and confirm its availability. The Allante was a limited production, two seat luxury roadster designed by Italian coachbuilder Pininfarina and built with Cadillac running gear. It was expensive to produce because the bodies were flown over from Italy to be assembled in Detroit, and only about 3,000 per year were built for its seven-year run. This is a beautiful, fun and rare Cadillac with only 39,000 miles on it that could be yours. Red just seems like the right color for this car. A subtle color on a Cadillac roadster just wouldnt seem right. The lines of the car however are simple and clean. The hood slopes down to a rectangular grill with the Cadillac emblem proudly displayed in the center flanked by rectangular headlights. Body colored bumpers have chrome strips set into them for a little flash and there is a thin chrome line running down the side of the car. Clean lines continue at the back of the car with simple rectangular taillights with Cadillac in script on them. The manually operated convertible roof is black and in addition, there is a Red removable hardtop that is nice for use in the winter and gives the car a whole other look. The car sits on factory alloy wheels with Cadillac centers all around. Open the door and you will find a door panel sets the tone for the interior with a dark brown upper and tan lower. Of-course there are power windows and lock at your fingertips as well as a two-position seat memory switch that controls dual Recaro 12-way adjustable seats that are comfortable and supportive works of German engineering and art. A unique two-spoke wheel sits in front of a digital dashboard with easy to read displays and the original 38,906 miles showing on the odometer. Controls for lights, wipers, and cruise control are at your fingertips just below the display with the climate control system as well as the driver information system within easy reach in the center console. At the bottom of the console is the GM/Bose symphony sound system that was, and still is, a great sounding system. Below the stereo is the T-handle shifter for the 4-speed automatic transmission and in the back, you will find a good-sized trunk plenty big enough for two sets of golf clubs. Under the hood you will find a 4.1-liter V8 with a tuned intake manifold system that feeds high-flow cylinder heads. It sits transversely in the engine bay because this is front wheel drive car, (which is a big reason that the trunk on this car is so large). An F-7 4-speed automatic transmission gets the power to the front wheels and an independent strut type of suspension handles the curves in this roadster without sacrificing Cadillac ride quality. A Bosch antilock brake system operates 4-wheel disc brakes for safety and performance and the rubber meets the road through 225/60R15 tires all around. Check out this fine example of a unique and rare Cadillac. You might be glad you did and end up driving it home.